I bought a pair of ladies pajamas from Aldi about five years ago, and it was a total dud. The pants were tight and on the short side, and the shirt was wide, loose, and short. The proportions were all wrong, and it was impossible to wear the pajamas without feeling like my body was somehow deformed. After that I was wary of most clothing from Aldi. However, fellow Aldi Reviewer writers Joshua and Elizabeth both have had decent luck with Aldi clothing during the last couple of years. 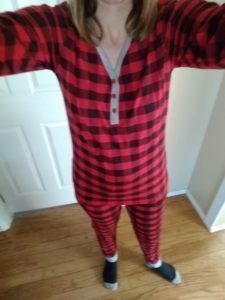 I’ve been needing some new pajamas, so I decided to give the Special Buy (ALDI Find) Serra Ladies 2 Piece Thermal Sleepwear Set a try. These pajamas are $12.99 and come in a variety of patterns, including some holiday prints. I opted for the preppy-looking and less holiday-ish red and black plaid with gray trim. The jammies feature functional buttons going about halfway down the shirt front, a drawstring waistband, and side pockets. Thanks for the pockets, Aldi. These are certified OEKO-TEX, meaning they are free from harmful levels of over 300 substances. As usual, you should wash these before wearing them. Use warm water and do not bleach. More importantly, the packaging says do not tumble dry. That’s right. You need to hang dry these pajamas. Do not put them in your dryer. That’s fine with me because I hang many of my clothes to dry already; I’m slightly taller than average and it prevents my clothes from shrinking too much in length. (I recommend Aldi’s Easy Home Clothes Drying Rack, usually available in the fall. I like it so much I own two.) The packaging also states you can iron these pajamas on low heat, but who really does that? Also a no-brainer: you should not dry clean these. So how do they fit? I wear a size 6 or sometimes an 8, and I opted for a medium, which the package says fits sizes 8-10. (Medium is the smallest size available, according to Aldi’s online ad for these pajamas.) Other sizes include large (claims to fit sizes 12-14) and extra large (claims to fit sizes 16-18). Based on past experience, Aldi’s clothing does seem to run small. The tricky thing about almost all of Aldi’s adult clothing is that it comes packaged in cardboard or, in the case of these pajamas, in neatly folded ribbon-tied packages. It can be difficult to know what you’re getting because you can’t easily hold a shirt up to examine the dimensions. However, I saw several of these pajama packages that had been opened and were in various states of disassembly in the store, so I think people were trying to determine if these would fit them. I don’t blame them. I like pajama pants with fitted cuffs at the bottom, so they don’t ride up to my knees while I’m sleeping. The medium fits me just right. It’s a little on the snug side, but in a cozy way rather than too tight. If you’re a size 10, I would recommend buying up a size and getting the large. 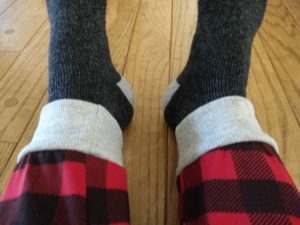 For me, the pants are a great fit, and I like the slightly snug cuffs at the bottom that will help prevent my pants from bunching up at my knees while I sleep. 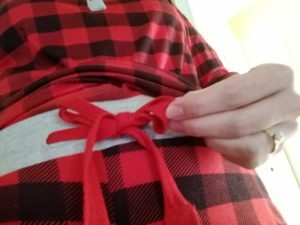 The drawstring at the waist is made of a chunky ribbon that is not exactly flattering when the shirt is layered over it, but it’s not a big deal because they’re just pajamas, and it’s not uncomfortable when sleeping. The chunky ribbon drawstring at the waist. The shirt is great, too, except for one thing. My only complaint about these pajamas involves the sleeves. The ends of the sleeves, where my wrists come out, are really, really wide. They gap so much that I can feel a draft. It’s like they were made for a woman who has disproportionately fat wrists but is smaller everywhere else. It’s odd because the pant cuffs have just the right amount of snugness, while the sleeves are vastly larger. What’s interesting is that when I place the pant cuffs and sleeve cuffs on top of each other, they look like they are the same size. I’m pretty sure that for ease and efficiency in manufacturing, they simply used the same cuffs for pants and sleeves, but it means the sleeves are way too wide for an actual human wrist. These sleeves are made for people with very fat wrists. It’s the same type of problem — although less pervasive this time — that I had with the first pair of Aldi pajamas I bought several years ago; the proportions are off. It doesn’t bother me enough that I want to return the pajamas to Aldi, but it is annoying enough that I’ll probably continue to be cautious about clothing I purchase at Aldi in the future. Additionally, sometime during the second or third time I washed these pajamas, one of the buttons unexpectedly fell off of the front of the shirt. I didn’t notice the button was missing until I put the pajamas on. Because it fell off during the wash cycle among other clothing, I have not found the button yet, and I’m not sure if I ever will. I’ll probably have to find a different button that may or may not completely match to sew on as a replacement. Aldi’s Special Buy Serra Ladies 2 Piece Thermal Sleepwear Set is cute and fits well, other than the sleeves, which gap a lot. One of the buttons on the shirt fell off during its second or third trip through the washing machine as well, so I have to find another button to sew on. Otherwise, the pajamas look fine and are comfortable. where can I purchase more Serra Leggings? 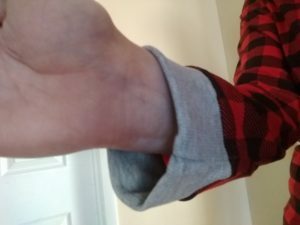 I purchased a pair of Serra wide waist band leggings that went all the way to the ankle from Aldi’s in Weatherford, TX shortly after thanksgiving. I purchased 1 pair and I love them.. Just can’t seem to find more. where or how to purchase more. I wear a size large. 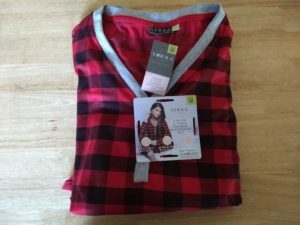 All of Aldi’s clothing items are ALDI Finds (Special Buys) that are available for a limited time only. Once they’re gone, they’re gone. They usually sell leggings a few times a year, though, so keep an eye on the weekly ads.